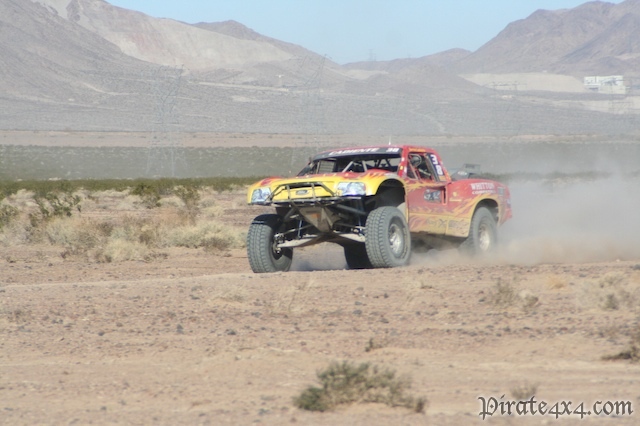 Ex Rock Crawling Champ Mike Shaffer getting ready to do battle in the desert. 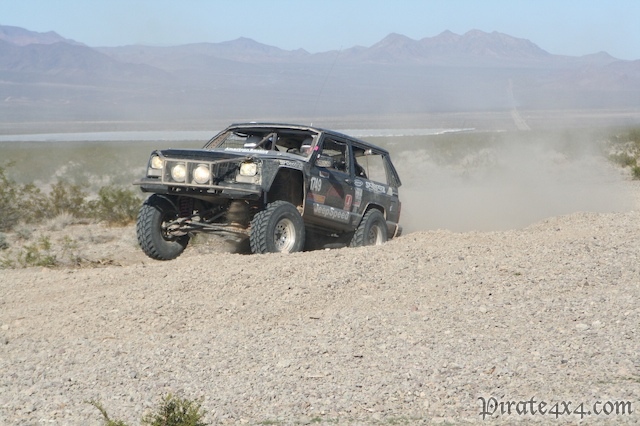 Being a virgin to desert racing I really didn’t know what to expect when I agreed to cover the Henderson Terrible 400 for Pirate4x4, and let me tell you there is nothing like the experience of a desert race. 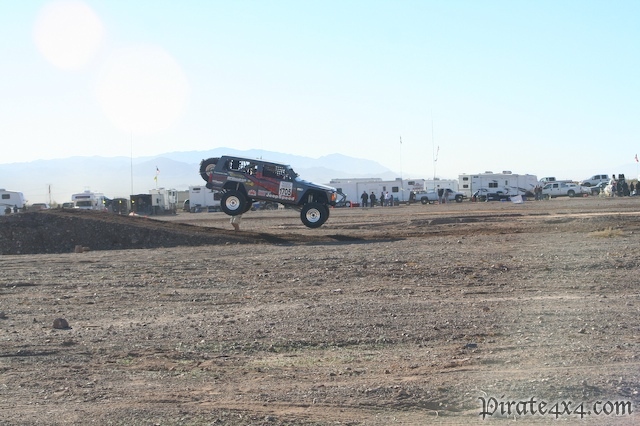 Coming from a rock crawling background you see some pretty impressive things at comps, but get this: there were no less than 7 team semis at the main pit, and on race day there were 3 chase helicopters hovering overhead for various teams. 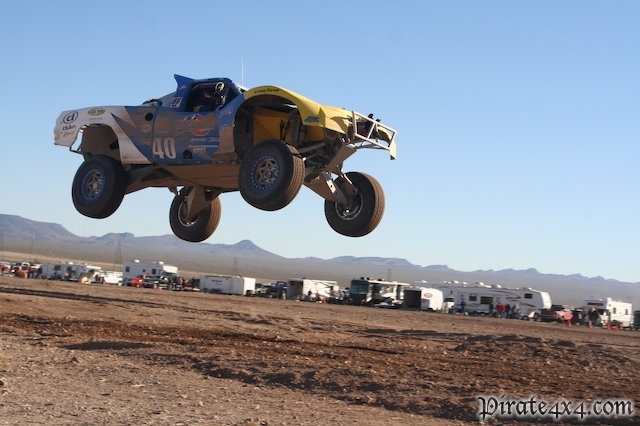 There is some serious money in desert racing with trophy trucks costing upward of $250,000. Heck the UTV side-by-side ATV looking vehicles were $40K!!! Talk about BLING! The dirtbike, ATVs and UTVs are first on course and are lined up at the start line and being released in 30 second intervals. The dirtbike, ATV and UTV classes ran the first leg of the full size vehicle course, and then broke off onto their own 35 mile course consisting of sand flat sections, power line road sections, and rocky steep incline and descents. Their course was much more technical in nature than the full size vehicle course. At 9:00 AM the last of the dirtbikes, ATVs and UTVs cleared the full size course and the first of the Trophy Trucks and Class 1 vehicles were released from the start line. You gotta love a 800 horse power Trophy Truck getting it on the infield course at 120 MPH before leaving on their 81 mile lap across the dry lake bed, through the whoops, over the mountains, through the silt beads, across another lake bed, back over the mountains and back to the main pit. As the rest of the classes were staged and released, driver of record of the 1705 Shaffer Offroad JeepSpeed Mike Shaffer and co-driver Camo line up staged second to last in the field of 19 JeepSpeeds. Also amongst the competitors was Steve Cramer from Full Traction in the 1718 rig. This was the first event for Steve in over 13 years! Great to see you back behind the wheel again Steve! 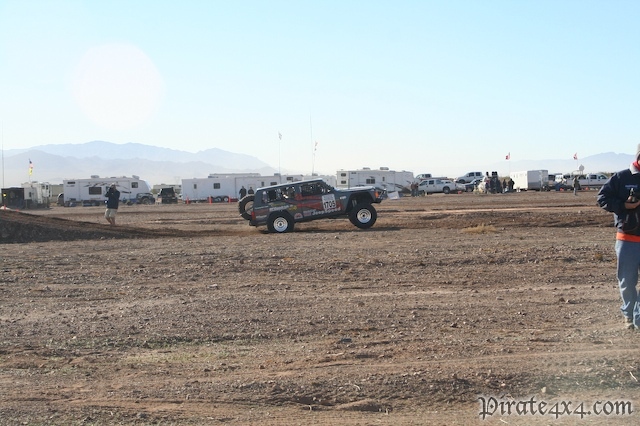 The green flag dropped for the first JeepSpeed and it entered the infield course, which is a mile long course each vehicle must go through before leaving the main pit area. For those that haven't been to a desert race, the first part of the race is usually in an infield course between two pit lanes. This particular infield contained 3 jumps, three sandy hairpin turns, and a small silt bed. Not the easiest way to begin a race, but it's great for the crowd at the start/finish line. Shaffer and Camo catch some air in 1705! Of the 19 competitors in JeepSpeed some of the teams had fallen off the pace, or just plain fell out of the race. 1718 of Steve Kramer and Kevin Davis lost a pulley on the motor on lap one between Pit 2 and Pit 3, and after working on the rig to piece it back together they were back on course. The 1743 Fabtech Jeep of Chris Armein pulled into the main pit after lap 1 off the pace of the rest of the class due to a ball joint issue. Some grinding, BFH usage, cutting and welding, and the vehicle was back out for lap 2. With 30 miles left on their first lap, the 1788 team learned that yes, you really can hold a completely cracked in half frontaxle together with a ratchet strap. They did make it back to the main pit for repairs and finished the race! Henderson's finest doing what they do best. The 1730 Jeep of Rusty Hartling lost an output shaft before they left the infield. 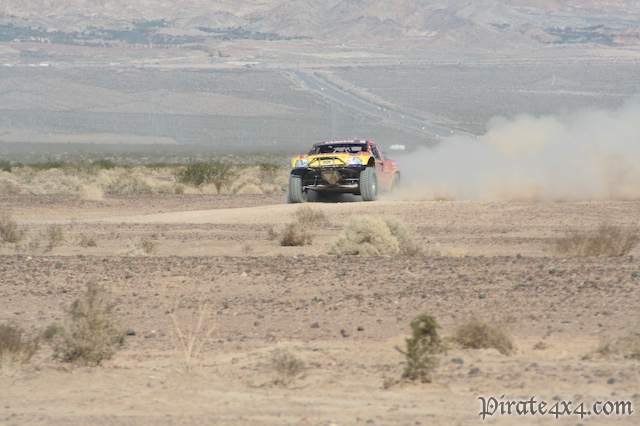 Their teammate Jim Cope in the 1745 Jeep was still on course and gaining ground on leaders Jason LaFortune in 1795, Kieth Marion in 1750, and Eric Heiden in the 1717. Less than 10 minutes behind Jim Cope were Mike Shaffer and Camo. The top 5 JeepSpeeds after lap 1 were all within 20 minutes of eachother. The G&R Trophy Truck was haulin'! Our pit crew jumped into the chase truck and we headed down Highway 95 to Pit 1 with spare parts just in case. Across the dry lake bed to our right we could see the rooster tails and dust clouds from the race cars flat out getting it across the dry lake bed. "We just passed the yellow 1717 and it is on its lid. 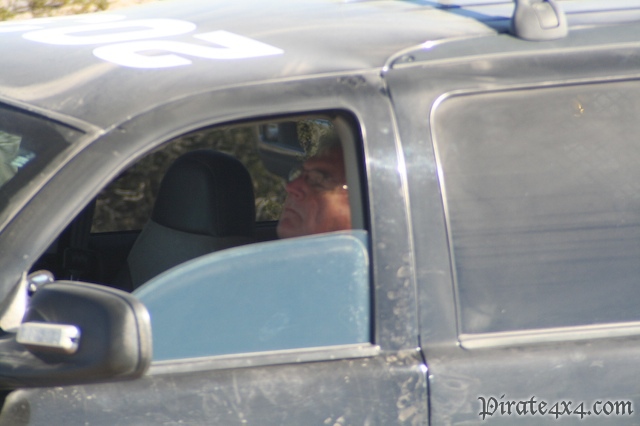 Driver and co-driver are out of the rig, we radioed it into JeepSpeed already." The 1717 JeepSpeed was tagged by a Trophy Truck, which ironically enough no vehicles are supposed to bump a JeepSpeed or Class 11 vehicle. The driver of 1717, Eric Heiden, was air lifted by one of the helicopters back to main pit to be checked out by the paramedics. He was then cleared for injuries, although extremely sore. 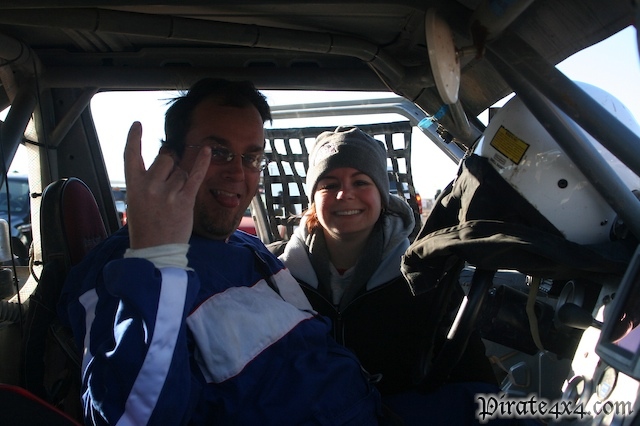 The 1717 vehicle wasn't in bad shape, but had a broken battery cable that they managed to piece back together, then co-driver Josh climbed into the drivers seat and one of the pit crew became co-driver and off they went for lap 2 finishing the race in 10th place. Eleven of the 19 JeepSpeeds finished the race within the 9 hour time limit, and the last of the finishers rolled across the finish line after dark. Congrats to Shaffer/Camo for finishing 4th in class and 19th overall in a field of 120 vehicles. They also finished 5th for the season in JeepSpeed.